At Chebeague Island Inn, our passion for the island and surrounding region is no more apparent than in the kitchen where our Chef transforms seasonal, local ingredients into elegant dishes that would be right at home in Maine’s trendiest restaurants. Featuring a menu created by 2018 Food Network Chopped award-winner, Matt Ginn of Evo Kitchen & Bar in Portland, you’ll marvel at our remarkable combination of creativity, freshness and flavor. How committed to local are we? Lobster is delivered right off the boat. Second Wind Farm, where we get as much produce as possible is right on island. We pluck herbs and smaller produce from our Chef’s Garden. And our mussels frequently come from neighboring Bangs Island. We invite you to join us for an exceptional dining experience overlooking the ocean. The restaurant is a popular spot with guests, locals and day visitors alike so reservations are recommended. We use opentable.com or you can call the Inn at 207.846.5155 in season. Our menus often change slightly a few times each week to incorporate island produce, but our servers will be sure to notify you of the modifications. We can also accommodate all dietary restrictions, and encourage you to speak with us in advance depending on the severity. We know there’s no better way to celebrate a special occasion (or a fun night out!) than a private meal. Our Hamilton Room, outdoor dining and a seaside tent create a perfect atmosphere for you to enjoy the benefits of a private event. We’re happy to customize your menu, or even your meal, for that added touch. Please reach out to us and we will be happy to speak with you about your vision. Our philosophy is simple and straightforward: Prepare local food in creative ways that enables their natural flavors to shine. We take advantage of Maine’s micro seasons, our Chef’s Garden and the farm on island so our menus are always changing. 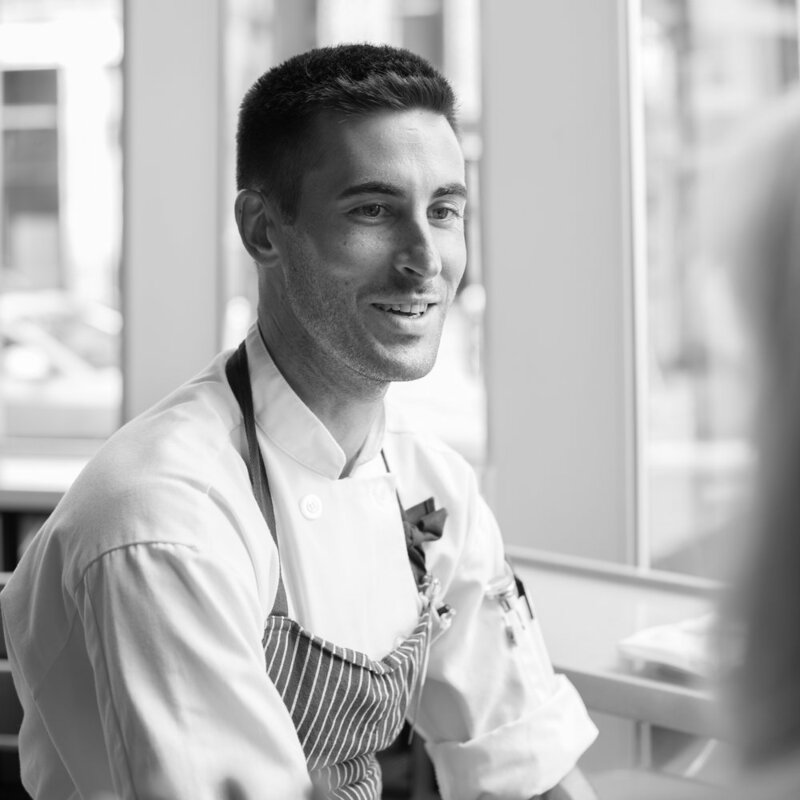 Chef Matt Ginn runs the team at the Inn and at our sister property, Evo Kitchen + Bar. He’ll tell you that one of his favorite times of the day is the ferry ride to the island, where he chats with locals and dreams up menu items. Congratulations to Matt for winning an episode of Chopped on Food Network! In addition to sourcing ingredients from Maine farms and fishermen, we’re extremely fortunate to have a few resources on island. Like you, there are many times we want to enjoy a good meal in the comfort of our home and not have to cook. We’re pleased to offer a wide range of catering services for on-island and off-island events. Please reach out to us so we can speak with you further. Stop by the Inn for a sampling of fine wines from our menu, and select varieties from our various distributor representatives between 2:45-4:30pm each Wednesday through September 5th.